Finally, my 50th post!!! I never thought I would reach this far in my blog. 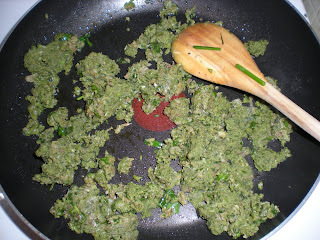 This blog was first intended for university students that do not know how to cook or that need some inspirations. It was also intended to show how great food can be cooked in a such little time. Now, it seems that people from different part of the world are checking my blog. I will keep updating as much as possible while I am still in school. 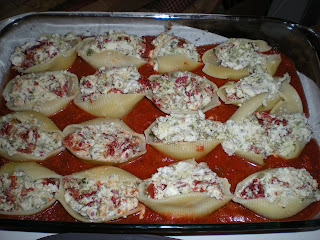 Looking through many food blogs, most of the blogs actually have at least one stuffed shells pasta recipe and wanted to have one of my own. In my recipe, I added prosciutto, I think I am becoming an addict to prosciutto. I also wanted to try to add some sun-dried tomatoes to it. Finally, I throw in some chives which is not as a strong flavor than green onions. Like in lasagna, ricotta cheese is a must. 1. Cook pasta as directed in a large pot in boiling water until al dente. Drain and return to pot to keep warm. 2. 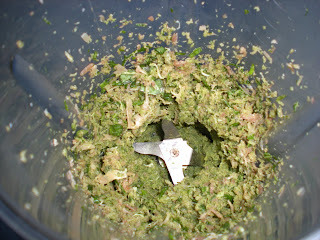 Meanwhile, place prosciutto, chives and basil in a blender or food processor until chopped. 3. Heat oil over medium heat. Add prosciutto mix and cook for 5 mins. 4. 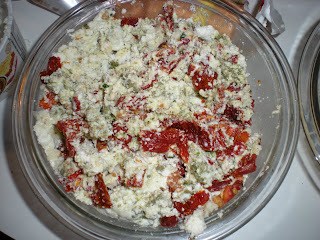 Transfer to a medium bowl, add ricotta, sun-dried tomatoes. Stir well and season with salt and pepper if needed. 5. Pour sauce into a 13'' x 9'' baking pan. 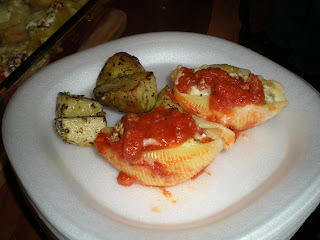 Spoon mix into shells and put it on top of the sauce. Sprinkle with mozzerella cheese. Bake for 25-30 mins or until golden. Spoon sauce over shells and serve. Mmmmm, that looks great! I'm always looking for new (but EASY) dishes to try. This is going on the list!